Payroll Mate® makes processing payroll easy and affordable. Gas station and convenience store payroll software that supports daily, weekly, biweekly and monthly payroll processing for part-time and full time employees. Process payroll for single or multi-location Gas stations in-house without monthly fees. Pay attendants, technicians, cashiers, customer service reps, managers, mechanics, washers and other employee categories. Hourly, salary and per-piece payrolls supported. Payroll Mate® assists you with processing your payroll in a matter of minutes so you still have plenty of time to dedicate to everyday operations. For $119 only, process payroll for up to 10 locations with up to 75 employees per location for one calendar year. When running a gas station, you may need to dedicate a lot of your time to focusing on marketing and running your day-to-day operations. Processing payroll by hand or without a payroll software can be very time consuming. Payroll Mate® can offer you the solution you need, all without having to learn a complicated program. With this in mind, here are a few ways in which Payroll Mate® can help you with your gas station payroll. • Setting up Payroll Mate® can be easily done by following the step-by-step wizards in the program. This ensure you have all of the necessary information in order to process your payroll. Need further assistance? You can refer to the built in tutorials or contact our friendly customer support by phone, email, or live chat. 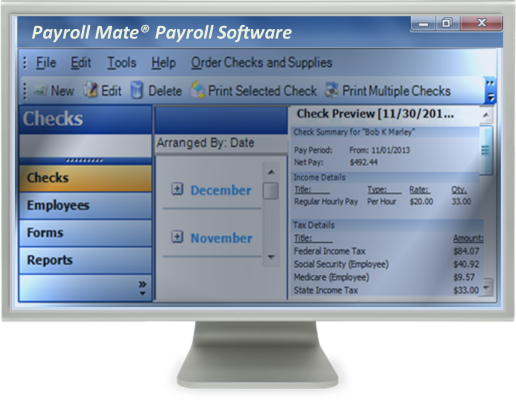 • Payroll Mate® is Windows compatible. Do you prefer to use Mac? You can easily install Payroll Mate® using virtualization technologies such as Oracle Virtual Box and Parallels Desktop. • One of the most challenging aspects for any business when administering payroll can be ensuring that taxes are calculated correctly. With Payroll Mate®, Social Security, State and Federal withholdings, and Medicare taxes are automatically calculated. • Payroll Mate® will also auto calculate sick and vacation time accrual. • With Payroll Mate®, you can print or email reports in a few easy steps. Reports include: Payroll Journal Summary, Deposit Requirement, Employee Earnings, Employee List, Payroll Totals, Payroll Detail, Taxes & Deductions, and many more. • If you run a gas station, you have to pay special attention to your vendors. Since you probably deal with dozens, you will want to make sure you take care of any 1099 issues. With an additional cost add-on feature, you will not have a problem as Payroll Mate® can handle this. • Payroll Mate® supports part-time, full-time, salaried, and many more types of employees. If the software does not include a certain income type that pertains to your employees, you can simply custom create it. • Payroll Mate® also support different pay frequencies including daily, weekly, bi-weekly, semi-monthly, and monthly. • You will also have the ability to custom create any type of tax or deduction category that pertains to your employees. • Take advantage of our easy to use backup and restore feature so you can ensure you never lose pertinent payroll data. Even if you are not tech-oriented, you can back up all your data with the click of the button. Print traditional ready to sign payroll checks. You can also print and email pay stubs for your computer shop’s employees. For an additional cost add-on feature to Payroll Mate®, you can even use our convenient direct deposit. Payroll Mate® makes paying your gas station employees easy and affordable. The program offers all the features needed to run payroll for a gas station in a fraction of the time needed to do the same task manually, and in a fraction of the cost needed to use a payroll service. These are only some of the features of Payroll Mate. Please refer to the Payroll Mate payroll software page for more details. © Copyright 2018 Real Business Solutions.